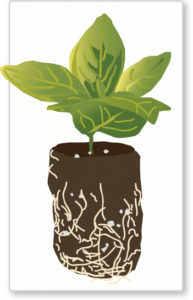 Fertiss® is a ready-to-use plug made by wrapping soilless propagation media with a cellulose based nonwoven net. Propagation in Fertiss® plugs is very simple and straightforward. The Fertiss® plugs need to be misted briefly, first, to avoid having media run off from the top of the plugs during saturation. After the initial misting, irrigate with a hose and a breaker (nozzle) to saturate the Fertiss®. It will take approximately two to three passes with a hose for complete saturation. Once the Fertiss® is saturated, insert the cuttings. For a standard 1.5″ (4 cm) tall plug the insertion depth should be approximately 5/8″ (1.5 cm) deep. The frequency of misting depends on greenhouse conditions such as light intensity, temperature, humidity, and also the air movement. Mist the cuttings right after insertion. Generally after that, mist for 6 seconds every 8 minutes. In the case of geraniums and most of the herbacious crops, run the mist system through the night for the first day or two. 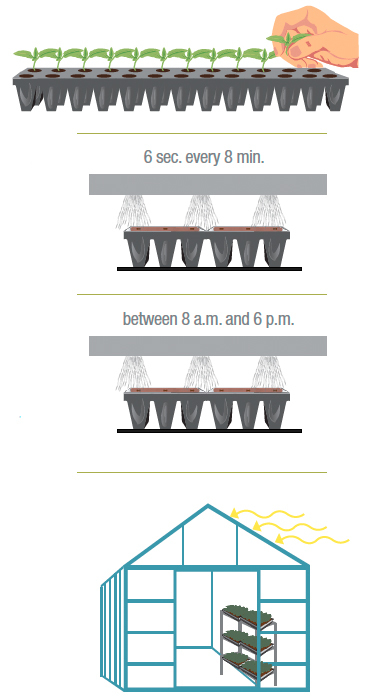 After the initial crucial stage, mist between 8 a.m. and 6 p.m. As the cuttings recover, the misting frequency can be reduced. Never let the cuttings wilt and at the same time do not overwater. After two weeks, with most of the herbaceous crops, misting can be stopped. From that time on, water once a day, or as required. Maintain high humidity (90 – 100%) levels and reduce air circulation to avoid wilting of the cuttings. It is undesirable to have low humidity and high air circulation, as this will increase the requirement for misting. Light transmission into the propagation house should be indirect or diffuse. This is not a concern during winter months, but during summer months, the use of a whitewash on the glazing or retractable internal shade curtains (or a combination of both) to provide a good system for light modulation. The recommended light levels for propagation are 200 to 250 μmol·m-2·s-1 or a daily light integral (DLI) of 4 to 5 mol·m-2·d-1. Once the cuttings are 2 weeks old, a light level of 300 μmol·m-2·s-1 can be provided. It is a challenge to provide the above mentioned light during winter months, but even small supplemental light can significantly improve the rooting and overall quality of the cuttings. In general, optimal rooting occurs when the root zone temperatures are maintained (usually with bottom heating) between 75° and 80° F (24° to 26° C). Maintain air temperatures between 70° to 74° F (21° to 23° C) during the day and 68° to 72° F (20° to 22° C) during the night. After 7 to 10 days into the propagation, the recommendation is to fertilize the cuttings every two to three days with a complete nutrient solution containing 150 ppm Nitrogen via an overhead watering or sub-irrigation system. In case there are crops that show nutrient deficiencies within the first week after sticking (example: some petunia varieties) add a complete nutrient solution containing 50 ppm Nitrogen to the mist from the very beginning of propagation. Conduct in-house trials to determine the best fertilizer protocols for your propagation requirements of various crops. Geraniums and most of the herbaceous plants are fully rooted in 4 weeks and are ready to transplant. Once the cuttings are fully rooted water daily (in summer) or every alternate day (in winter) or depending on the greenhouse temperature. Inspect the liners and never let them dry out. When transplanted at the right time, no extra care and handling is required. Water the pots thoroughly after transplant. Later, follow your standard watering protocols. If you have any questions or need further clarification, please contact your OASIS® Grower Solutions Representative.